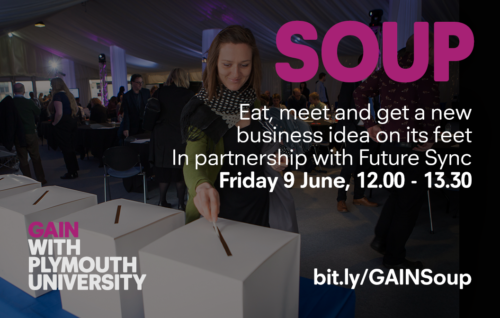 GAIN is teaming up with Future Sync on the 9th June to host the latest Soup pitching competition for start-ups. GAIN is teaming up with Future Sync on the 9th June to host the latest Soup pitching competition for start-ups. This is the eighth Soup event since February 2016 which has helped start-up entrepreneurs across the South West win cash prizes and a support package from the University and its partners. GAIN is now seeking four local innovators for the lunchtime event who would benefit from this novel pitching competition. The event concept is simple, four businesses pitch whilst the audience enjoys a bowl of soup, the audience then vote for their favourite at the end of the pitches and the winner is announced after a short networking session. The business with the most votes wins all the funds from the ticket sales (a minimum cash prize of £500) plus a package of business support from GAIN, Devon Chamber of Commerce and Futures Entrepreneurship Centre at Plymouth University, as well as from the team here at Formation Zone. Pitchers have just four minutes each on stage to impress the crowd with no use of PowerPoints or props. Any entrepreneur wishing to promote their business and gain pitching experience can apply to pitch, application is via a quick online form. This event is sponsored by PKF Francis Clark and takes place on Friday 9th June as part of the Future Sync conference on Plymouth University campus. Future Sync is a day conference running three tracks of workshops, speakers and networking for creatives, tech enthusiasts, entrepreneurs and educators. A discounted, combined ticket for Future Sync and Soup can be purchased via the Future Sync ticket site or alternatively a ticket to attend just the Soup event is also available here. More information can be found on the Plymouth University Soup webpages and for those wishing to pitch, you can apply through this online form. Selection will be made on 15th May and applicants will be notified shortly afterwards giving time to prepare for pitching. A speakers workshop will be held in late May for pitchers to attend and use to prepare for their pitches.